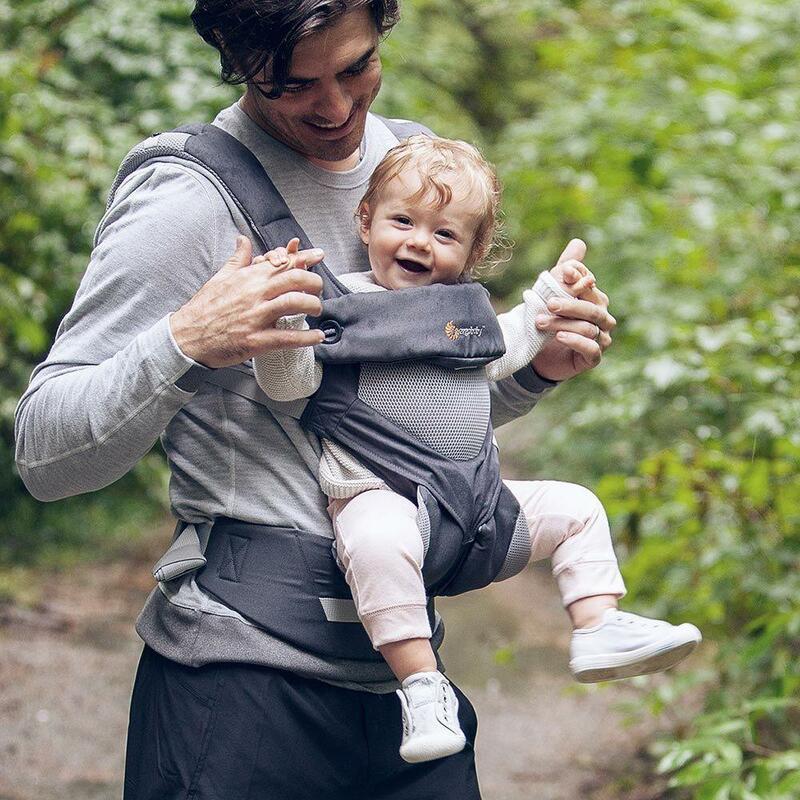 The Ergobaby 360 carrier has, until very recently been one of the mo st sought after carriers in our sling library (now pipped to the post by the Ergobaby OMNI 360- see our Spotlight on the OMNI 360). It is one of the top selling baby carriers from one of the most well known babycarrying brands. It gained its name “360” for its ergonomic forward or world-facing positions, so can be used on the front, in both inward and outward facing positions, and on your hip, as well as on your back. The Ergobaby 360 features a highly structured panel, which creates a bucket seat giving the excellent ergonomic hip position you can see in these images even in its facing out configuration. The adjustment of the panel between outward and inward facing is as simple as changing the button fastenings near the base of the panel between the outer buttons, for parent facing, and the inner buttons for outward facing. It is a buckle carrier which is worn with rucksack style straps, and the standard Ergobaby 360 has a velcro waistband, whilst the mesh version of the carrier has a buckled waistband. It is suitable from around 4 months to 2 years old, and can be used from birth with the optional infant insert. 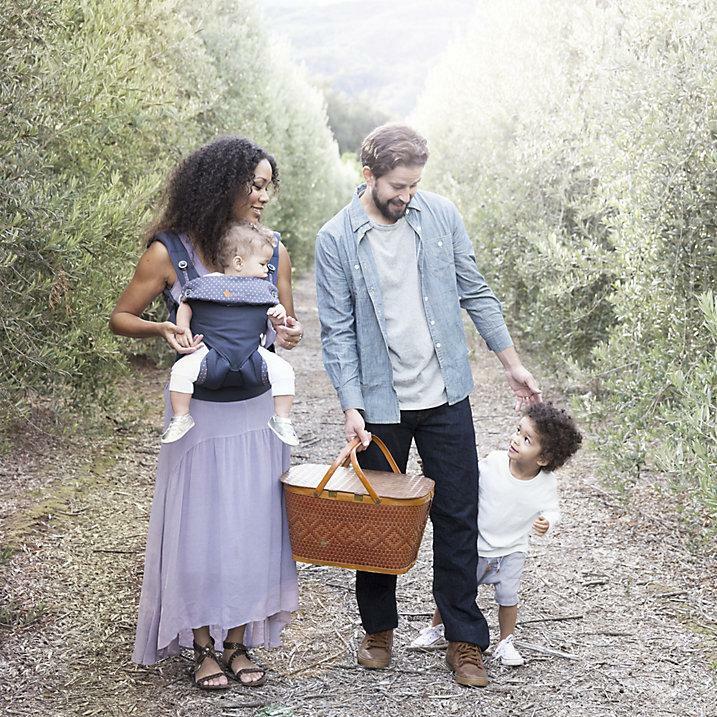 Parents love the Ergobaby 360 because it offers a range of positions, giving a versatile range of carrying options, and comes from a brand they love and trust! 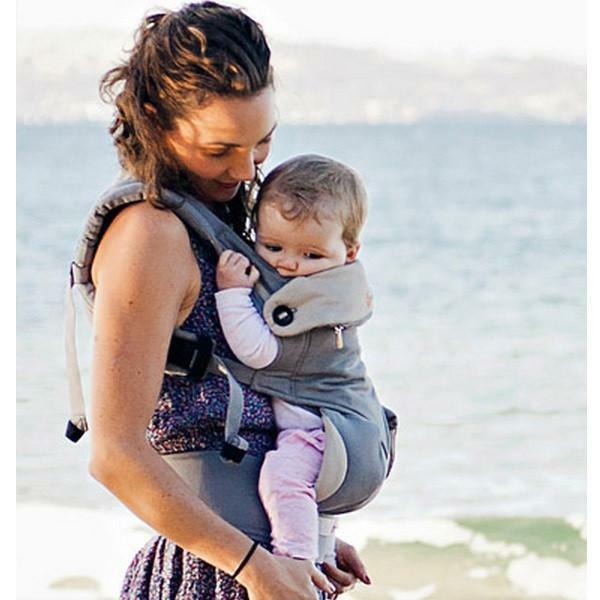 Where should the chest strap be on the Ergobaby 360 when front carrying? The chest or back clip on the Ergobaby 360 is movable and can slide up and down to be moved to the perfect position for you. Many people find that the most comfortable position is near the bottom of the shoulder blades, where a bra strap typically sits on a woman. However it can be moved over a fairly large area and it is worth playing around to find the ‘sweet spot’ for you. Ideally the chest strap should ensure that the shoulder straps sit straight on your shoulders without slipping off. How do I do up the chest strap behind me? Getting a buckle done up behind your back can be fiddly! There are lots of different methods available to you to make using your Ergobaby 360 even easier. Often the easiest method can be to lengthen the shoulder straps and do the chest strap up before putting your baby in. Once you have your baby in the carrier, simply put the strap over your head, put your arms through the shoulder straps and then tighten. How do I get my baby on my back alone? Many people are a little daunted at the idea of getting their baby on their back alone however there are several methods. Often the easiest method to start out with is the secure hip scoot. There are also several methods to get your baby down again alone. A simple option is to find a secure seat on a sofa or chair and carefully remove your baby and the carrier. With older babies you can lower them to standing or you can reverse the hip scoot to bring your baby onto your front. What age can I use my Ergobaby 360 from and to? The Ergobaby 360 is suitable from around 4-5 months old, when your baby can sit in the panel and still bend their knees freely. If you have the infant insert it can be used from birth. The 360 is safe to use whilst the top of the panel still comes up to your child’s armpits, however many parents may find other larger panelled carriers more comfortable before this point. Many parents we work with find they want to try something larger around 18 months to 2 years. The outward facing position is advised from 5 months old, and the hip and back carry positions are advised from 6 months old. How do I use the infant insert correctly? Would you like to try an Ergobaby 360? You can Hire (Grey, Dusty Blue, Carbon Grey Cool Air Mesh), and Buy the Ergobaby 360 from us here at It’s A Sling Thing. (If you check the bargain corner, there are sometimes some available at bargain prices with an infant insert.) If you’d like some advice about whether its the right sling for you why not get in touch or book a free short phone, 30 minute phone or half hour or one hour skype consultation?